Posted on 1, April 2016 by EuropaWire PR Editors | This entry was posted in Industrial, Netherlands, Transportation & Logistics and tagged APM Terminals, Kim Fejfer, MOROCCO, transshipment terminal in Tangier. Bookmark the permalink. Port operator APM Terminals to develop a new transshipment terminal in Tangier with an annual capacity of five million TEUs. APM Terminals MedPort Tangier will become operational in 2019, serving multiple trades and will be the first automated terminal in Africa. 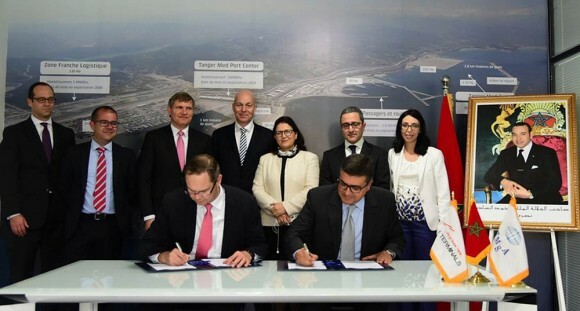 The 30-year concession of APM Terminals MedPort Tangier will complement the current operations of the existing APM Terminals Tangier facility. Tangier, Morocco, 01-Apr-2016 — /EuropaWire/ — APM Terminals has been named as the operator of a new container transshipment terminal at the Tanger Med 2 port complex. APM Terminals already operates the APM Terminals Tangier facility at Tanger Med 1 port, which started operations in July of 2007 and handled 1.7 million TEUs in 2015. The new terminal will have annual capacity of five million TEUs. Total investment in the new terminal is expected to be EUR 758 million. Maersk Line will be an important customer of the new terminal. The new terminal is scheduled to open in 2019, under the terms of a 30-year concession agreement with the Tanger Med Special Agency (TMSA), which has responsibility for the development and management of the Tanger Med port complex. APM Terminals MedPort Tangier will feature state of the art technology and have up to 2,000 meters of quay length and will feature the technology pioneered at the APM Terminals Maasvlakte II Rotterdam terminal which opened in 2015. APM Terminals will create a new organization in Tangier, adding a large number of new jobs and be responsible for the completion of the terminal yard, surface, buildings, container handling equipment, and integrated automated systems. The quay wall construction and site reclamation for the first 1,200 meters has been completed by the Tangier Med Port Authority, which is part of TMSA. “APM Terminals has been in Morocco since the creation of our first company APM Terminals Tangier in March 2005 in partnership with AKWA Group and the start of port operations in July 2007. Today’s announcement shows our strong commitment to investing in trade and improving supply chains in the West Med market. Morocco and its port arm, TMSA, have been very supportive of APM Terminal’s vision for the West Med. APM Terminals MedPort Tangier will bring important innovation and future capacity into the West Med market on one of the world’s most strategic seaways – the Strait of Gibraltar” said APM Terminals CEO Kim Fejfer. For APM Terminals the Western Mediterranean is an important market. APM Terminals Algeciras, on the Spanish side of the Strait of Gibraltar, operates in tandem with APM Terminals Tangier as an integrated Western Mediterranean transshipment hub. APM Terminals Algeciras handled more than 3.5 million TEUs in 2015, and has completed a major upgrading of its cranes and quay infrastructure to accommodate Ultra-Large Container Ships (ULCS) of 18,000 TEU capacity and above. The location of the Tangier and Algeciras facilities provide a natural transshipment location for cargoes moving on vessels to and from Africa from Europe and the Far East on the primary East/West shipping route through the Mediterranean Sea; over 200 cargo vessels pass through the Strait of Gibraltar daily on major liner services linking Asia, Europe, the Americas and Africa. While African ports at present account for only 4.5% of global port throughput (including transshipment cargoes), the United Nations 2015 World Population Prospects Report projects that more than half of the world’s population growth between 2015 and 2050 will occur in Africa, with the African population more than doubling from 1.1 billion to 2.4 billion over the next three and a half decades. Significant investment in port and transportation infrastructure will be required to meet the anticipated needs of the expanding African population and corresponding economic growth. APM Terminals is the largest port and terminal operating company in Africa by equity-weighted container volume, with 12 facilities operating in 10 countries and three more terminals under construction.